Before he conceived Vindictiv, Swedish guitarist Stefan Lindholm played with another similar project, Firecracker. Born of Fire is the compilation of this predecessor to the successful heavy/progressive metal of Vindictiv. As on Vindictiv's works, Lindholm is joined by eminent keyboard player Pontus Larsson, expect much interplay between the two throughout this disc. Perhaps the most outstanding feature of Born of Fire is the sterling vocal performance of Tommy Kerevik from Seventh Wonder. He definitely has the skills, and should have been the first choice for Vindictiv. While the Vindictiv albums showed major diversity, and strong progressive arrangements, Born of Fire is more traditional melodic hard rock and metal as Blind Date and Back Broken prove. The intricacies of prog are more subtle here, and you can here them on the song Second Self. Honestly, this disc seems more a showcase for Lindholm's twiddling and widdling neo-classical fret skills and lesser, Larsson's keyboard skills as the instrumental of track four (title: The Instru?) demonstrates. Otherwise, Born of Fire is merely adequate stuff. If anything, with Kerevik on vocals, Born of Fire sounds a bit like Supreme Majesty without the hooks. In the end, Lindholm's Vindictiv is definitely more challenging and inspiring than Firecracker. This makes me wonder if Escape Music is merely capitalizing on, and profiting from, the success of Vindictiv. Shame on them. Nevertheless, Born of Fire shows Lindholm's vision for, and the roots of, his best accomplishment. If you're a fan of his Vindictiv project, then this is a must buy for you. 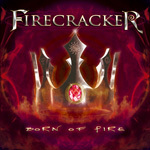 As a predecessor to his Vindictiv project, guitarist Stefan Lindholm's Firecracker and the compilation Born of Fire is adequate foreknowledge and rudimentary melodic hard rock and metal. Lindholm twiddles his neo-classical way through the work, but his Vindictiv stuff is much better.